About Sogui W. Message Sogui W.
Sogui is a wonderful guide, I highly recommend booking him. I went to Goree Island with a friend; my friend is a historian and I have a degree in African studies, and we both learned so much from Sogui about the history of the island, slavery, Senegal and pre-colonial history in West Africa. He is passionate about sharing knowledge and we were very satisfied. TOUR GUIDE RESPONSE: Thanks a lot for your 5 stars.All the pleasure is for me .Keep on learning wolof.You already have a very good level .Great thanks for booking my tour !! Sogui is an amazing guide. He is fluent in French, English and Spanish. He gave us a real flavor of Senegal, its history, its culture and its life. Don't hesitate to choose him, he is the best! TOUR GUIDE RESPONSE: Thanks a lot once again !! It's was a real delight to be with you.Great thanks for appreciating and loving Senegal. More than just camels! Accommodations were much nicer than anticipated. Great food, great local music, and company by locals. Definitely fit this into your itinerary! TOUR GUIDE RESPONSE: Once again, thanks a lot for booking my tours.It was a great pleasure to be with you and I am ready to share my love for this beautiful country with all my next clients. By far the BEST part of our trip! We stopped in many small villages meeting locals and enjoying the company of children. Sogui was very flexible and accommodating to individual preferences. Definitely coming back! TOUR GUIDE RESPONSE: Thanks a lot for your five star.It was a real pleasure for me to be with you!!! Experience of a LIFETIME! 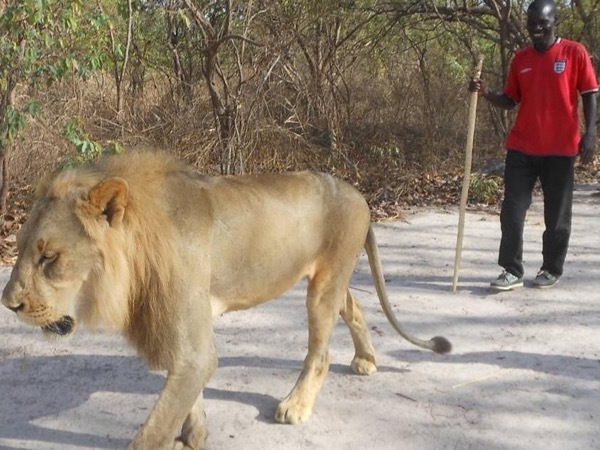 Not only was the walk with lions great, but the round trip had many other experiences to offer. Sogui dedicates a separate driver to ensure he's available to explain local landmarks and history along the way. Highly recommend when visiting Senegal. TOUR GUIDE RESPONSE: Thanks a lot for appreciating my tours !!!! Fantastic tour! Booking day 1 of our first visit to Senegal was a perfect way to familiarize with Dakar. Sogui was simply the best guide we've experienced in all of our travels. Very friendly and adaptable to individual needs. Would book again! TOUR GUIDE RESPONSE: Thanks a lot !!! !